Winter is with us ……… but Spring is on it’s way! It may be Winter in this neck of the woods, however my garden is coming alive with perfume & colour – so Spring mustn’t be too far away. It is amazing how one day there is nothing and the next day is quite different. 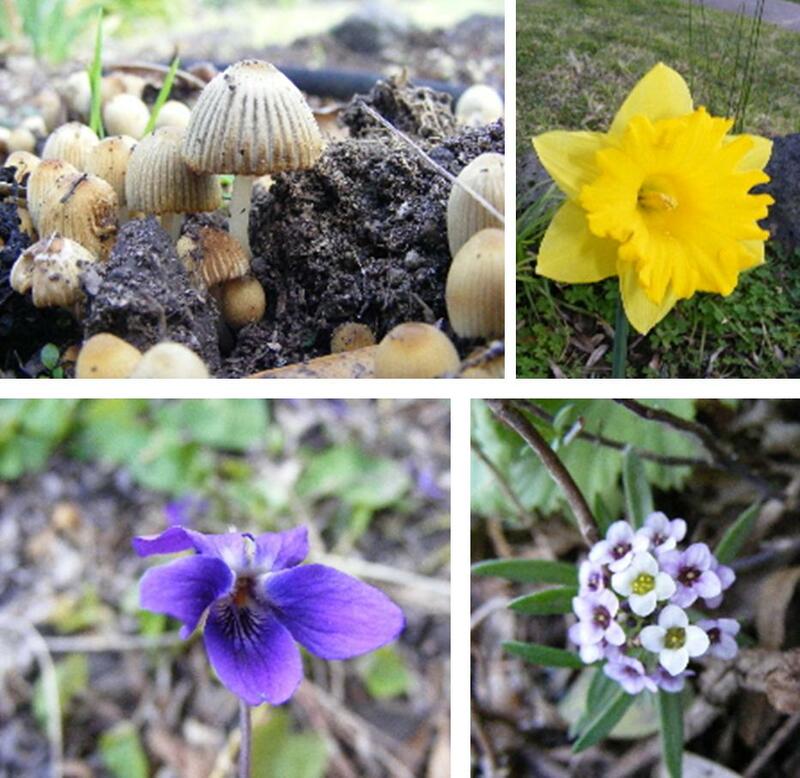 Here are a few pictures of what I found yesterday in the garden. 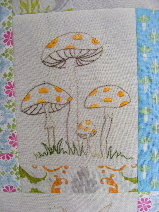 Are there fairies in the bottom of your garden too, dancing under the toadstools? Bitten by the Knitting Bug …..
Just a small bite, didn’t take long at all to get over. Have you been bitten this year too! 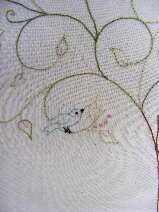 I’m back to show you a picture of my current project that has just come out in Homespun magazine Volume 13.7. It is the Christmas in July Issue that is packed full of some great projects for Christmas, with a really cute wallhanging from Anni Downs of Hatched & Patched and an angel from Natalie Bird of The Birdhouse to name just a few. 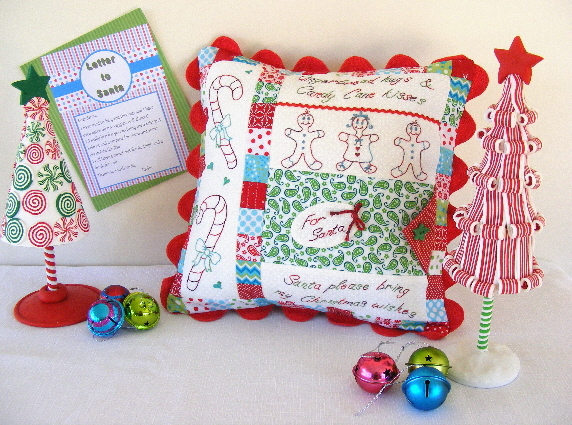 My project is a cushion called “Wishes Do Come True” that has an envelope opening on the front to pop in a letter for Santa. I have also made a quilt that coordinates with it called “Gingerbread Kisses” and there is a giveaway of patterns in the magazine, so why not try your luck at winning one. 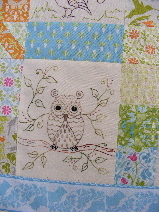 The pattern retails for $22 and shops can run the quilt as a block of the month over 3 months if they wish. 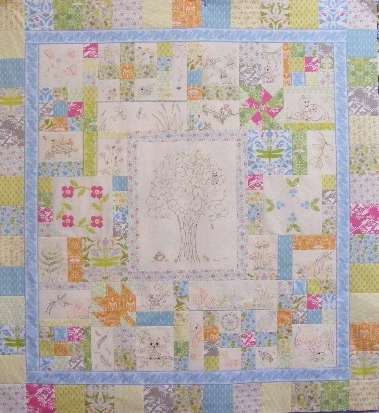 Patterns are available at The Quilters’ Patch, The Patchwork Angel & Blue Willow Cottage. 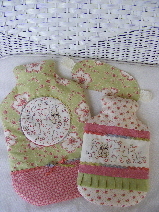 Check with your local patchwork shop if you wish to purchase one and they can order one in for you from me. I think it would look great also done in traditional Christmas colours of dark red, green, mustard & gingerbread colours. All this talking of gingerbread now makes me want a nice hot cuppa and some gingerbread – YUM!!! I hope you like my new project. It will be on display on the Blue Willow Cottage stand at the Craft & Quilt Fair in Melbourne in 2 weeks, pop by to see it up close and you may even see me helping out on the stand so don’t be afraid to say “Hi”. My cuppa is beckoning me, alas no gingerbread – chocolate will have to do!!! This is a rather long post, so here are a few pictures of what I’ve been up to. 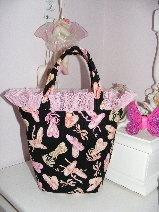 This is my popular little Ballet Slipper Bag now made in a different ballet fabric which is available from The Quilters’ Patch, a lovely little store in Moorabbin. Another reason I have been rather busy is because I have been working on my new Block of the Month, Nature’s Gifts, which is available exclusively in the “Garden of Delights” fabric range at The Quilters’ Patch. Contact Laurene if you are interested in joining her Block of the Month program. It was such a lovely quilt to make. I had a lot of fun making my daughter’s Paris themed birthday afternoon tea. 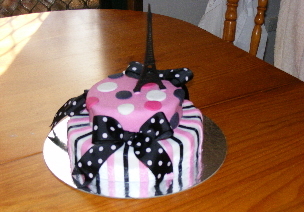 Here is a picture of her cake. Country Hart in Port Pirie in South Australia are again running a Project of the Month program this year and I was excited to be involved in it again. 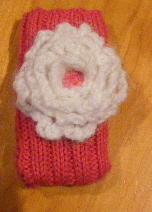 Here is a picture of my project which will soon be available as a pattern (end of July) to anyone who may not have been involved. Perfect for our colder months of the year. Robyn has recently moved to a new shop which is absolutely gorgeous, a picture of it is on her blog. I had a lovely time recently attending Heavenly Patchwork in Clontarf, Queensland for their annual retreat. The weather was beautiful, a lovely change from the coolness of Melbourne. the ladies are delightful and always make me feel like I am at home. Some travel quite a distance to be there and I am so glad that we have all become friends. These are a couple of paterns I made just for the retreat which will be available soon on my website. 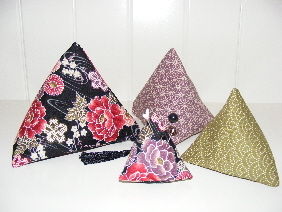 They are small projects that retail below $10 each and are quick to make. 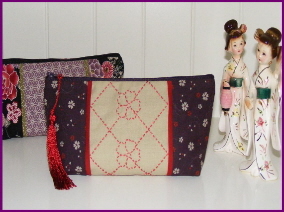 The theme for the retreat was “Japanese”, so I hope you like them. This has been a long post so will end now and be back with the latest news soon. Lots of catching up to do ………. The year is seemingly flying by and I have once again neglected my postings, but with good reason. Sometimes things in life pop up and distract us from the things we love, this has been one such time. While I won’t go into details, a close family member became ill towards the end of last year and while there is improvement in health there is ongoing treatment which needs to be dealt with and this is why I have been quite distracted from blogging. 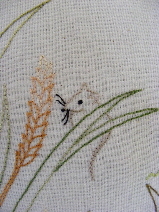 I do have a few new projects and news to share with you and will do a brief catch up during the day with some pictures.